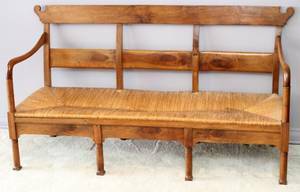 Realized price for 19th C. Partner's Bench. 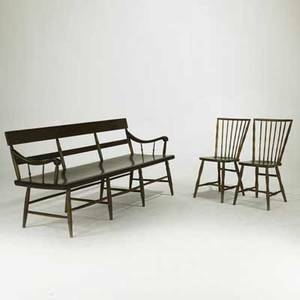 Tete-a-tete/conversation bench poylchromed with hand painted figural scenes of seats of courting couples. 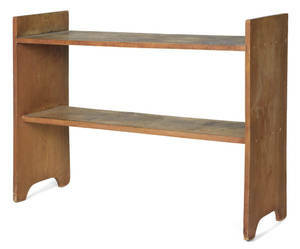 Height 28.5 inches, width 43 inches, depth 20 inches. 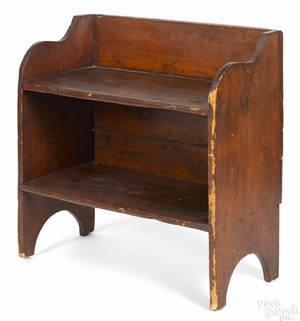 Seat to floor 16 inches. 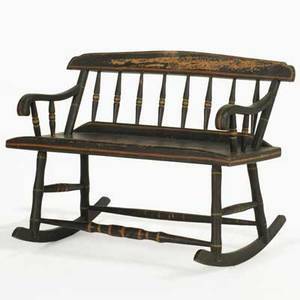 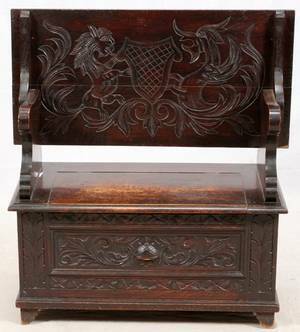 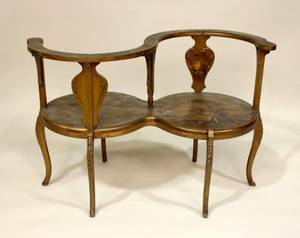 Archived auctions similar to 19th C. Partner's Bench. 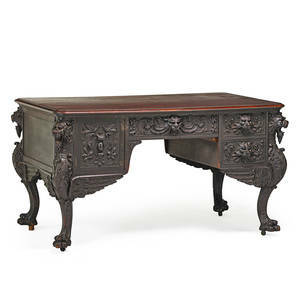 Renaissance revival partners desk; mahogany carved frame with winged griffin supports and drawer fronts, 19th c.; 31 1/2" x 56 1/4" x 34 1/2"
George III mahogany veneer partners desk, 19th c.
Victorian walnut partners desk, late 19th c.
Nursing bench; ebonized wood with rockers, traditionally called a ""mammy"s bench,"" 19th c.; 31"" x 42"" x 30""
Country furniture group; deacon bench with plank seat together with two rodback windsor side chairs, early 19th c.; bench: 34" x 72 1/2" x 26 1/2"
ENGLISH THREE SEAT BANQUET BENCH, 19TH C, W 68"
English wrought iron garden bench and table, late 19th c.
Stained pine bucket bench, 19th c.
CARVED OAK MONK'S BENCH 19TH C.
Pine bucket bench, 19th c.